SunnyCal introduces the FEMA-1 prefab solar array structure designed for rapid deployment. Now solar arrays and support structures can be folded for shipment, and erected in minutes. 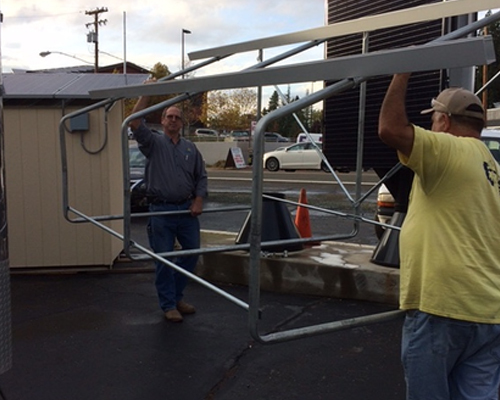 This lightweight support frame is ideal for small off-grid installations. It can be easily placed for initial fast tie-in, and can later be moved to new a location. 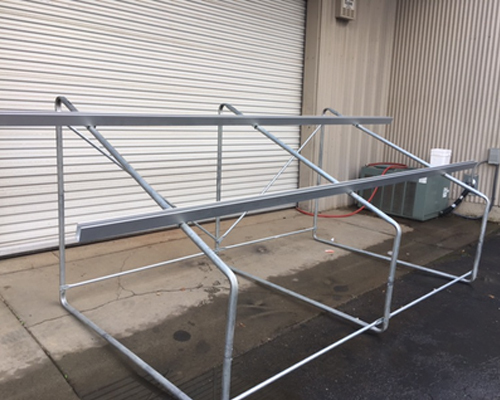 The FEMA-1 is shipped with legs folded under the solar rails in order to minimizes size. Once unpacked, the legs can be unfolded into position, and secured by set screws. FEMA-1 can be secured to prevent uplift and theft using ground screws. The FEMA-1 holds up to four 330 watt solar panels(60 or 72 cell). It can be equipped with optional “Daylight Solar Inverter”. The Daylight Inverter produces AC voltage whenever the solar panels are in direct sunlight, producing off-grid power without batteries. The underlying support structure is a strong and lightweight configuration, with collapsing legs to minimize size for storage.